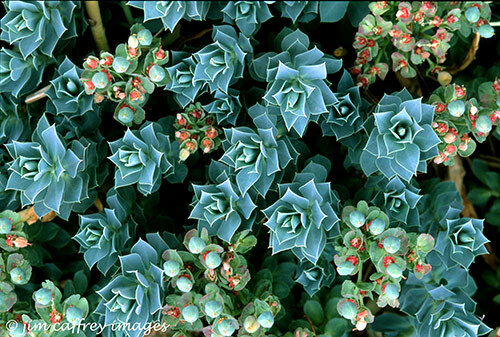 There was a time not too long ago when ninety-five percent of my photography was macro/close-up work. I made a conscious change to broader landscapes, and now ninety five percent of my images are landscapes. Go figure! Recently, while doing some research for a photography class I am teaching, I opened a book by John Shaw, one of the premier nature photographers of all time. One of the first things I noticed about John’s work is that he doesn’t just do landscapes, and he doesn’t just do macro/close-ups, he does it all, and he does it extremely well! So, I am now in the process of trying to strike a balance between the two. 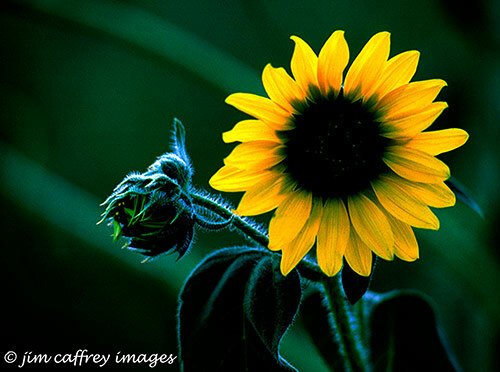 Macro/ close-up photography has one big advantage over landscapes: you can do it in your own backyard. There is a world right at your feet. All you have to do is look. I made this first image early one winter morning on my way to work. I was walking to my truck when I happened to glance down at the ground; there were all these amazing ice forms with some of the gravel showing through. It was just a matter of setting up my tripod and taking the shot. Winter is a great time for this type of photography. 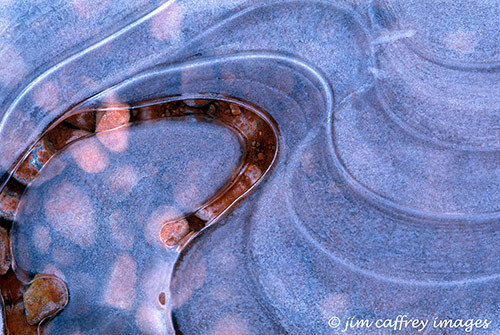 I love the patterns that can be found in ice and snow. 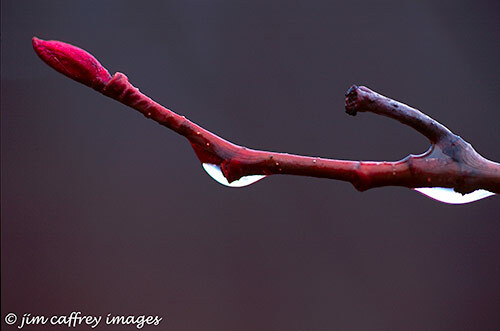 The image below was made in a friend’s driveway one winter afternoon. The arrangement of the leaves caught my eye, and again, it was a simple matter to set up the shot. 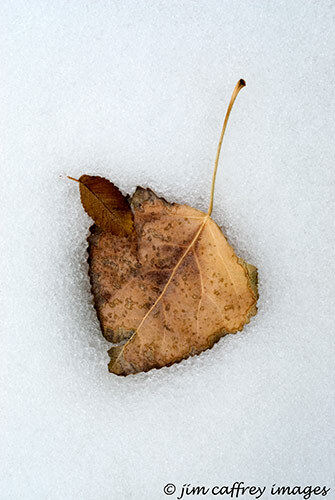 I like the slight depression in the snow around the larger leaf; it adds a little depth to the image. Sometimes it’s necessary to get down at eye level with your subject in order to find the image you’re looking for. I found this frozen weed stalk in my side yard one morning. The sun hadn’t hit that side yet, so the small plant was still covered with frost. I was kneeling on the frozen, snow covered ground while I framed and composed the shot, but I think it was well worth the effort. Spring is another great time to find photos at your feet. 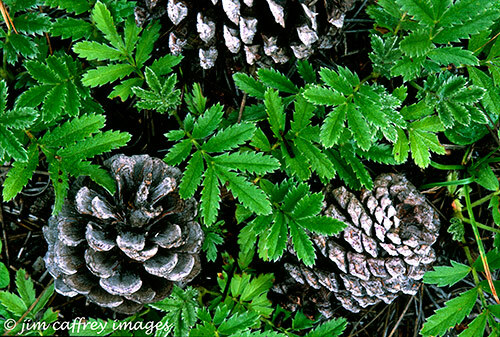 The world is awakening after it’s long winter sleep, and there’s plenty of new growth which is still fresh, not yet ravaged by the elements or insects. This last image has been a favorite of mine for a long time. It was made in my yard just after sunrise, again using my macro lens. All of these photographs, except for the second one which is a digital capture, were taken with a Nikon F100, using Fuji Velvia transparency film, and then scanned with a Nikon Coolscan V film scanner. So, the next time you find yourself looking for subjects to photograph, don’t forget the small world which is as close as a step outside your door. 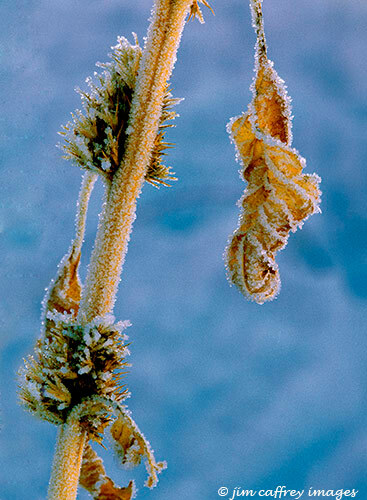 The remnants of a common weed captured on a frosty winter morning. 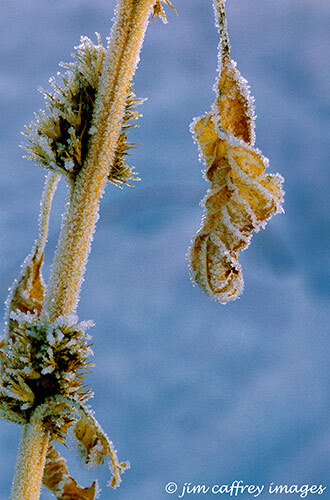 I was taken by the way the frost seemed to outline the veins of the leaf, and the small clusters on the stem. I shot this with a wide open aperture (f 2.8) in order to throw the background out of focus and create what is called a bokeh effect. Equipment: Nikon F100, 35–70 f 2.8 zoom lens, 81A warming filter, Bogen tripod, Fuji Velvia transparency film. Processing: Slide scanned to digital with Nikon Coolscan V–ED, Contrast, levels, curves, color balance, and Unsharp Mask adjustments in Photoshop. I think I must have photographed this waterfall at least a dozen times. I have used it for background in portraits, and I have photographed it at different times of the year. I think that, out of all the images I have of this waterfall, this is my favorite. The falls are fed by a warm spring, and they cascade over a cliff of basalt. They are tucked into a small canyon which is cut into the welded volcanic ash that makes up the surrounding mesas. There is a state highway a stones throw away, but it can neither be seen nor heard. As usual, when photographing moving water, I used a slow shutter speed, about .5 seconds, and stopped down for a wide depth of field to make sure everything was in sharp focus. The longer exposure time requires a sturdy tripod and head, and a remote release. Equipment: Nikon F100, Nikon 35–70 mm f2.8 lens 4x ND filter, Fuji Velvia 50 ISO. Processing: Nikon CoolscanV, curves adjustment, and greyscale conversion in Photoshop. Here is another example of what you can find if you just look down. I was walking out to my car one winter morning. There was ice everywhere, and there were these amazing patterns in it. I got my camera, and set the tripod over this small section of the ice with pebbles showing through. The way the pattern in the ice follows the curve of the bare pebbles reminded me of music (thus the name). Equipment: Nikon F100, Nikon 105 mm f-2.8 Macro lens, Fuji Velvia film. Processing: Nikon CoolscanV, curves, color balance, and saturation adjustments in Photoshop.